Designed for every truck enthusiast, the 2020 Toyota Tacoma is available in more than half a dozen combinations of cab size, bed size, engine displacement, and drivetrain configuration. Model grades include the work-ready SR series, the high-style, high-value SR5, the athletic TRD Sport, the adventurous TRD Off-Road, the ultimate trailblazer TRD Pro, and the top of the line Limited - ensuring there’s a Toyota Tacoma for every need, desire and budget. The most muscular Tacoma yet – the TRD Pro series – returns for 2020 with a revised look and new features. Sequential LED/DRL headlamps, 16” alloy wheels, black-insert tail-lamps and Rigid Industries LED fog lights headline the exterior changes. A new Panoramic View Monitor and Multi Terrain Monitor provide high-tech off-roading assistance while maximizing visibility for the driver with the ability toview conditions to the front, side and rear of the vehicle. 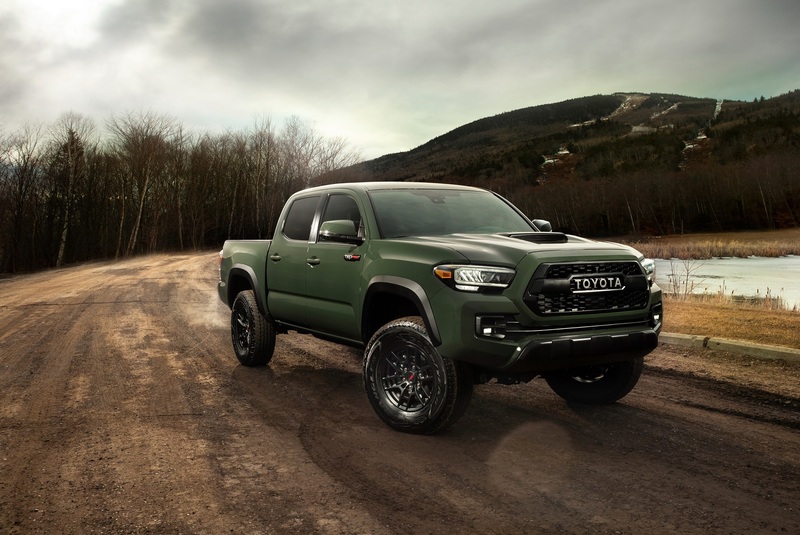 Other upgrades include retuned suspension systems, while a newly available Army Green is the TRD Pro exclusive colour for 2020. Almost every new 2020 Tacoma debuts a new front grille and new or updated wheel design. A new 10-way power driver’s seat enhances comfort on most models, while Tacoma’s multimedia system receives an upgrade with support for Android Auto, Apple CarPlay, and Amazon Alexa. Other upgrades, depending on model, include updated touchscreens for the multimedia system and an available LED bed lamp. And to ensure every trip is a safe trip, all Tacoma models are standard equipped with Toyota Safety Sense P – a bundle of active safety technologies that extend driver capabilities to help avoid accidents. The 2020 Toyota Tacoma headlines the Toyota presence at the Edmonton Motorshow – but there’s lots more to explore, too. Other featured vehicles include the Tundra full-size pick-up, plus the off-road ready RAV4 Trail and super sporty RAV4 Hybrid XSE. Visitors may also check out Toyota’s full range of stylish and fun-to-drive sedans, coupes, crossovers, SUVs, minivans and pick-up trucks, and learn about Toyota’s advanced yet user friendly technologies such as Toyota Safety Sense 2.0 and Toyota Connected Services. The Edmonton Motorshow runs April 4-7, 2019 at the Edmonton Expo Centre.